Find the magnetic flux Φ through a square with side of 3 cm, which is located near a long straight conductor with electric current of 15 A. One side of the square is parallel to the conductor with distance of 4 cm between the side and the conductor. The opposite side of the square is located 5 cm away from the conductor. Notify the equation for the magnetic flux through a surface of a conductor loop. Because of the position of the square and the conductor, the value of the magnetic flux will not be a constant in the square area, it will differ with the position. First of all, we will write down the equation for the magnetic flux Φ. There is a magnetic flux density included in this equation which can be represented as a magnetic flux density for a long straight conductor in this case. The distance of the conductor and the place, where we find the magnetic flux, will change with the position of the square. This distance is labeled as unknown r, which will be used as integral unknown. The equation for the magnetic flux is integrated over the square area S. Let’s divide the square into smaller pieces with the same magnetic flux density. These pieces can be represented as narrow rectangles with sizes of a (which is parallel to the conductor) and dx (perpendicular to the conductor). 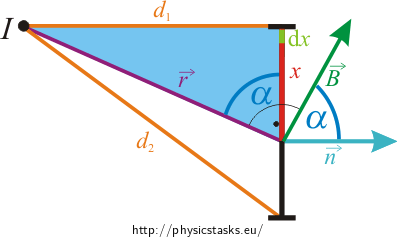 We can express the size dx using the distance r (see the triangle in the image). 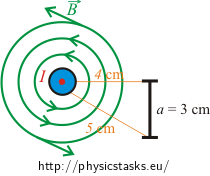 We express other unknowns in the equation for the magnetic flux using only the distance r.
where r is a distance between the conductor and the place, where we find the size of the magnetic induction. Because the distance r depends on the position in the square, we use it as integration unknown and express all other quantities in the magnetic flux equation using this unknown. where a is a side of the square parallel to the conductor and dx is an element part of the side perpendicular to the conductor, which should be expressed using integration unknown r.
Integration will be done over interval from d1 to d2, where the distance r differs. Let’s check if we have expressed the equation for element of area dScorectly. The size of the square is a = 3cm. The area of square is S = a2 = 9 cm2. Integrating this equation over interval from d1 to d2 should give us the same area. We can see that using the expression of the element of the aread S we got the correct area of the square. Magnetic flux Φ through a conductor square has value of approximately 20 nWb.